The post Considerata Exhibit: Where Art and Science Collide appeared first on When In Manila. Ever wonder what happens when science and art collide? These two contrasting subjects make a great masterpiece. Who would have thought that science and art could create a great exhibit that tugs on our hearts and minds? 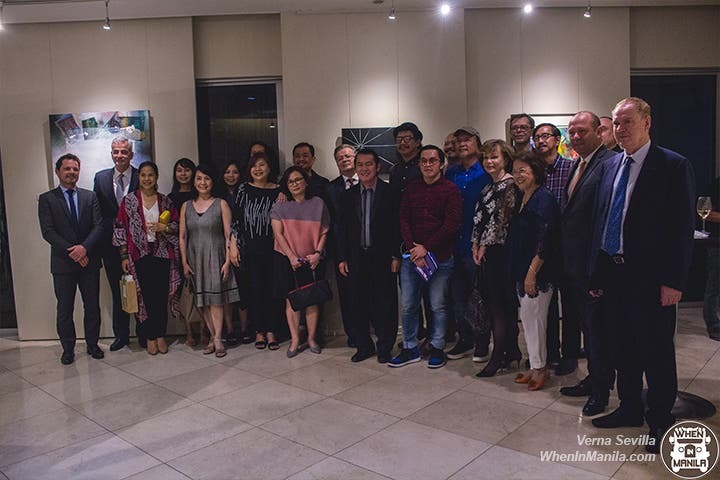 Considerata VII, written by Maria Isabel Garcia, is now on its 8th series and opened last March 1, 2019 at Alliance Française de Manille where the event was graced by the Ambassador of France to the Philippines: H.E. Ambassador Nicolas Galey, President of Alliance Française de Manille: Ambassador Cristina Ortega, and Mr. Fernando Zobel de Ayala. A woman of science, Maria Isabel Garcia’s poem emphasizes on our place in the universe and the potential of humankind. The Considerata I to VII is a series inspired by Max Ermann’s “Desiderata”. In this exhibit, 17 artists pulled outlines from Maria Isabel’s poem to give their own interpretations. The artworks are composed of photography, painting, sculpture, and new media. Made by artists Assemblage 1, Mark Bautista, Ninel Constantino, Cesar Caballero, Benjie Cabangis, Fritz Herrera, Chachu Lascano, Rico Lascano, Lenore Lim, Dan Matutina, Abe Orobia, Paul Quiano, Jay Ragma, Cid Reyes, Mitzi Reyes, Eghai Roxas, and Tof Zapanta, we are sure that you will look at art and science in a different way after visiting this exhibit. Gere are 5 simple reasons on why you should check it out before it ends this March 30. 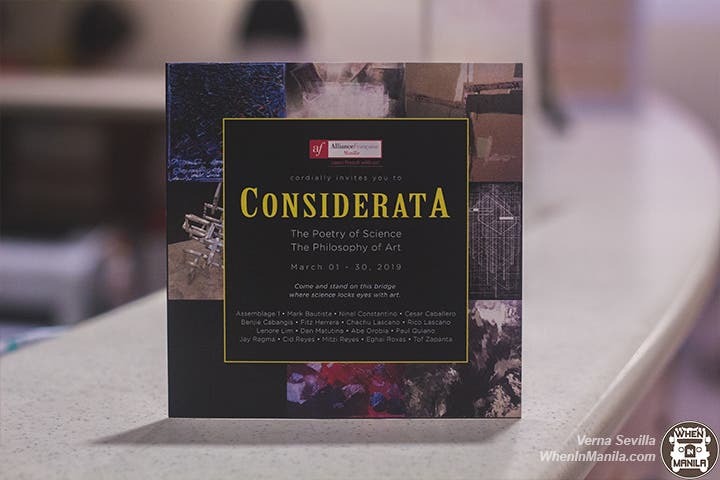 The young artists who joined the exhibit created a refreshing take on the poem Considerata. It’s amusing to see how different the artworks are from one another. You won’t get tired of taking in all the pieces and colors your see because of their variations. Science and art unite in one rare exhibit. When was the last time you saw the merging of two completely opposite subjects under one roof? This is not your typical museum exhibit because your mind and heart will feel a lot of things here, especially when you read the poem before going through the artworks. It’s both empowering and mind-boggling. It’s like a mini art fair. Did you miss Art Fair Philippines this year? Well, I did; so imagine my delight when I got to join Considerata on their opening night. Considerata is like a mini art fair because of the different media presented by the artists. From sculptures to installations and paintings – name it and you’ll see it here. You’ll go through a journey of self-discovery. The poem of Considerata is about self-discovery and relationships between others and ourselves. In it, Maria Isabel Garcia talks about how you should not compare yourself to others and how we should make use of our time wisely. Every word from the poem will help you discover yourself and know what’s in store for you in the universe out there. Go to support young Filipino artists. It’s about time that we appreciate and support the works of our Filipino artists. In the midst of the digital age where you can access everything in an instant, it’s so inspiring to see artists take their time to create a work of art. With their fresh interpretation of the poem, you’ll see how much soul and passion was put into every artwork presented at the exhibit. One of the verses in Considerata says: “If you’re going to stop time remember that it can stop itself. Redirect your stardust energy to living in it fully, instead.” Use your time wisely and visit this one-of-a-kind exhibit and marvel at the beauty where the poetry of science and philosophy of art collides.